As the Olympics thrilled London, another small piece of history also happened online. Amazon announced that their U.K. web site was now selling more ebooks for the Kindle than they were selling printed books! The news has generated some headlines – but it’s really just another milestone in a bigger ongoing story. Amazon had already revealed that ebooks were outselling printed books in America more than one year ago. Amazon’s CEO, Jeff Bezos, announced the news in a conference call with shareholders on June 7, 2011. And he’d shared the same surprising twist: an announcement that at the same time, Amazon was also selling more printed books than ever before. I’m reminded of the schoolteacher who taught her 5th grade class with Kindles. One of the students said it had made reading cool. Instead of outdated old copies of old-fashioned books, the students could read digital texts, search them electronically, and even share their favorite highlights right on their Facebook pages. Maybe Amazon’s actually increased the world’s interest in reading itself. That could explain why Amazon’s also selling more printed books. Jeff Bezos has a goal to create a “universal library, ” so they can always connect customers to the book they want — any book, any where. Amazon’s working that towards goal with “a team of missionaries,” Bezos told the investors, and maybe their enthusiasm is coming through the Kindles that they make. I love reading on my Kindle, and I like to think that Amazon understands that passion, and is just trying to keep sharing it with the rest of the world. I guess what I’m saying is that behind all the sales figures is a simple idea: that people will read more if you make it easy enough for them. 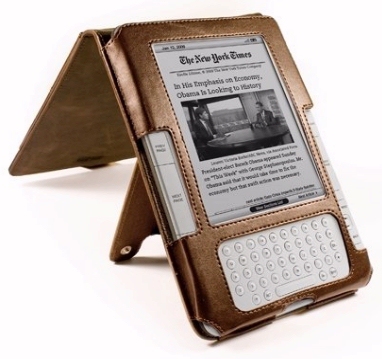 Surprise Amazon Sale on Kindles and Accessories!